Mechanical engineering company MEMA from Menden in Germany produces, among other things, rewinding machines for metal strips. 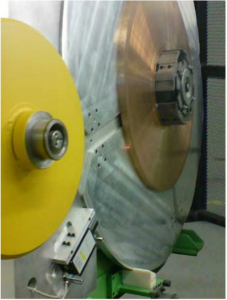 Finished coils are produced in the rewinding machine from individual ring-shaped metal bands. The metal rings are joined together coil by coil so that one continuous wound coil or spool is produced at the end. 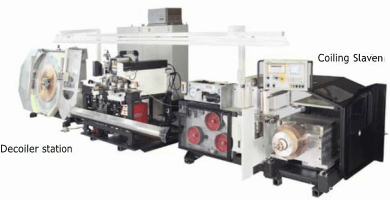 The machine is used for copper, steel or composite strips. When the spooling drive is accelerated to its laying speed, the ring diameter at the decoiler drive must be known so that both drive stations accelerate at the same speed, which ensures the correct tension of the strip. MEMA uses the laser distance sensor optoNCDT ILR 1181-30 for this application. The sensor reliably measures on very shiny to matt surfaces that have a width of between 5mm and 60mm. The strip reaches speeds of up to 800m/min. The optoNCDT ILR sensor is also used for the diameter measurement on coils in rolling mills and for the diameter measurement of paper rolls.